Mitchell Starc had to wait 36.2 overs to take his first wicket. AUSTRALIAN fast bowler Mitchell Starc entered uncharted territory in the first Test against Pakistan in Dubai. Starc bowled 36.2 overs in Pakistan's first innings, not striking until the final delivery when he had Yasir Shah caught behind. It is the longest he has ever had to wait to take a wicket in a Test match, eclipsing the 25.1 he bowled before breaking his duck against the same opponents at the Melbourne Cricket Ground in 2016. If not for the dismissal of Shah, it would have been only the second time he has failed to take a wicket in an innings where had bowled at least 20 overs - he bowled 25 against India in Chennai in 2013 without any luck. 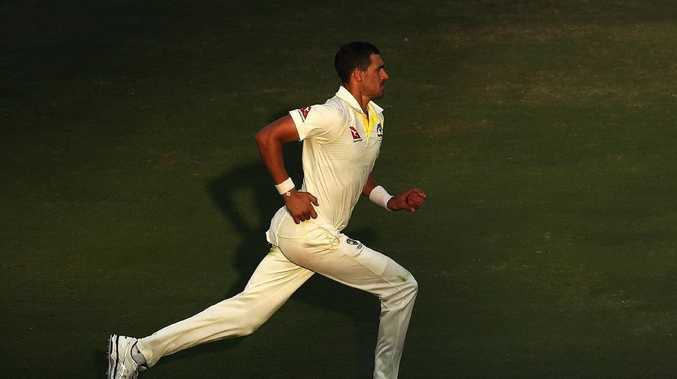 Playing his first match since suffering a right leg injury on the tour of South Africa, Starc bowled the third most overs of his career for a single innings, coming within two overs of eclipsing the 38 he bowled against Pakistan at the Gabba in 2016. Despite only taking one wicket for the innings, it was an impressive display from the left-arm quick, who was battling severe cramp at the end of day one and left chugging pickle juice. "There was a lot of pickle juice," he said before play on day two. "Travis Head looked after me. He had a couple of bottles in his pocket for me. It's only come in in recent times I think but it's supposed to help stop the cramps coming on. "Unfortunately they were already coming on for me so it was trying to (shorten) it a little bit. Cramps in both the calves and the groins wasn't fun but a good night's sleep and some rest and hopefully some wickets this morning." Starc was not the only Australian bowler to carry a heavy load across the first two days of the series, with Nathan Lyon bowling 52 overs for the innings. It is the most he has ever bowled in an innings, surpassing the 50 he bowled at Adelaide Oval in 2012.